SAL DeTRAGLIA'S VIRTUAL TAPAS BAR: A SHORT PRIMER ON SPANISH COFFEE. Coffee is a well-loved drink in Spain. 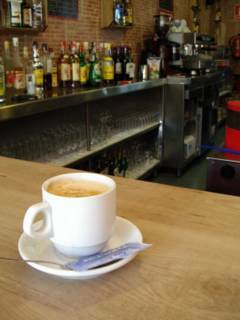 Its popularity is, perhaps, second only to “anything with alcohol.” A Spaniard will drink a coffee for breakfast, at mid-morning break, after lunch and, quite often, after dinner. Nearly every Spanish home has a chrome, art deco-style, stovetop coffee maker, but coffee is best – and most often – drank in a bar. And there is no creature on earth that makes better coffee than a crusty Spanish bartender. Spanish bartenders make coffee on large, steam-driven espresso machines. They use high quality, medium-roasted beans rather than the astringent, jet-black espresso beans favored by Starbucks and the Italians. A thick, brown stream oozes into cups propped below the machine’s chrome spouts, while the bartender simultaneously froths a stainless steel pitcher of whole milk with the steamer arm. Served in a ceramic cup or small, thin glass (but NEVER in a waxed paper cup), Spanish coffee is velvety, rich and flavorful. The well-established paradox that coffee, like roast chicken, smells a whole lot better than it tastes simply doesn’t hold water here. Spanish Bartender: Buenos días [in gravelly, tobacco-ravaged voice]. What can I get you? Non-Spanish Tourist: Buenos días. I’d like a tall, half-caf Latte with skim milk and a light dusting of nutmeg…to go, please. And don’t forget to put a lid on it. Spanish Bartender: Buenos días. What can I get you? I think you’ll agree that such a cross-cultural disconnect is not conducive to the spirit of international goodwill and brotherhood that so many people outside the White House are trying to nurture. It obstructs the bartender from earning his livelihood, and the jet-lagged visitor from his much-needed jolt of caffeine. I therefore – under strict orders from Kofi Annan – am pleased to provide the following roadmap for ordering coffee in a Spanish bar. Café con leche: A mixture of coffee and steamed milk – usually in a 50/50 to 25/75 proportion – served in a “large” (albeit laughably small by US standards) cup or glass. Most Spaniards drink this for breakfast. The bartender may ask if you prefer the milk caliente (hot) or templada (warm). Café cortado: Coffee that is “cut” with a dash of steamed milk and served in a small cup. This is usually ordered after lunch or dinner. Café solo: A shot of coffee without milk; served in a tiny cup. This is usually ordered after lunch or dinner. Café manchado: A cup of steamed milk “spotted” with a few drops of coffee. Carajillo: Black coffee spiked with brandy or anís (i.e., a Sambuca-like liquor). Wildly popular with older men. Café Americano: Coffee diluted with extra water, and served with or without steamed milk. How embarrassing it is to even mention this! Descafeinado: Decaffeinated coffee. You can request that any of the above choices be made descafeinado. Be sure, however, specify descafeinado de máquina (decaf from the machine). Otherwise, you’ll risk being served a cup of steamed milk and an envelope of instant decaf coffee. Now that I’ve provided the basic tools for ordering coffee in Spain, I’d like to close with a nugget of advice that I’ve verified countless times during the past five years: Look for a bar that has little natural light, littered floors, a dense cloud of cigarette smoke, and an older, disheveled-looking male bartender – never taller than 5’7’” – wearing a collared shirt. Preferably a white, short-sleeve collared shirt. A bar that satisfies these criteria will most assuredly serve you a stellar coffee…and serve it to you well. If there is an artfully-lettered sign hanging above the bar area listing its various offerings and their prices, turn around and head to the next. If the bar has a TV playing music videos, call the authorities. If any of the bartenders appear to be younger than 50 or – God forbid – wearing hair gel, don’t walk…RUN! Always remember…there is no correlation between good grooming or attractive surroundings and good coffee. If you don’t believe me, taste a Starbucks half-caf Latte with skim milk. Even a light dusting of nutmeg can’t save it. Something is missing in your description: Cafe bonbon, served usually in Viena Capellanes, Madrid. If we are going to split hairs, then I should further admit that I've also left out the descriptions for Cafe Teria, Cafe Annan and Cafe con Lechal. Oh hell, just give me a Coca Cola. I just returned from Spain and had fantastic coffee. The one part that I am not clear on is that many bars had esspresso con leche and cafe con leche. Is the cafe brewed in a different way? Quite honestly, I've never seen an espresso con leche during my five years here. But I can pretty much guess what it is. The difference between espresso and "normal" coffee is the degree of roasting. Espresso beans are roasted until they are nearly black. That gives them a strong, bitter flavor. "Normal" coffee beans are not roasted to such a degree. They are a chocolate-colored brown, rather than nearly black. Cafe con leche uses the "normal" roast beans. Your espresso con leche probably used ground espresso beans. The difference between your espresso con leche and a capucciono was likely in the milk. Capuccino uses both the steamed milk and the froth. Cafe con leche (and presumably, espresso con leche) uses only the steamed milk. Bartenders in Spain don't spoon the froth atop the coffee. This is a great page on Spanish Coffee. It is by far my favorite coffee in the world. Where can I find Spanish coffee beans and a Spanish coffee machine in the states??? You don't need a Spanish coffee machine. Just use an espresso machine. 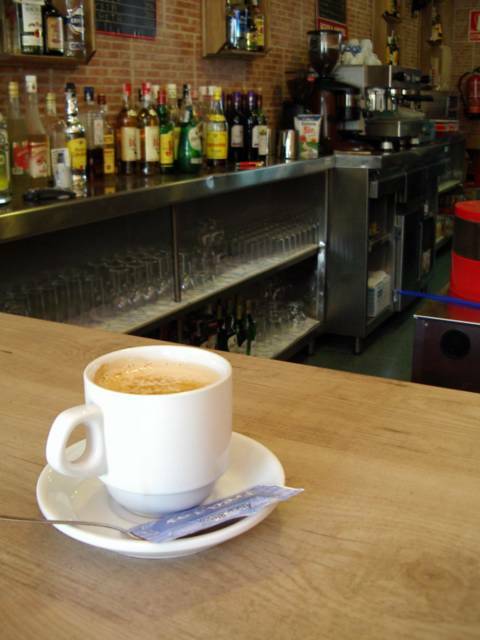 Many bars in Spain sport Italian espresso machines. Just don't use espresso beans. There's too dark. Just use normal-roasted Colombian coffee beans. Fill your cup 1/3 with coffee, and 2/3 with steamed milk. No froth! Just the milk. That's how to make a Spanish cafe con leche. If you don't have an espresso machine in your kitchen, then go to Starbucks and buy one of those $10 aluminum art deco stovetop coffee pots (i.e, the ones that ar octagonal shaped; put water in the bottom, insert funnel, fill funnel with coffee grounds, and screw together). THen heat milk in a saucepan. When the coffee is brewed and the milk is hot, pour 1 part coffee and 2 parts milk into a bowl or blender, then beat the two together (i.e., turn on the blender, or insert one of those electric hand-held mixers). THis will aerate the coffee and make it frothy and richer. Pour into your cup, and you've got a pretty good facsimile of a Spanish cafe con leche. If none of these ideas appeal to you, then buy a ticket to Madrid and visit the bar nearest to the airport. OMG!! I just got back from Madrid on Saturday and have to admit that i'm having SERIOUS Cafe con Leche withdrawals!! I actually bought ground coffee beans while i was in Ibiza and tried to make it myself at home, but it's just not the same! Thanks for your "recipe" on how to make it, can't wait to try it out... i hate starbucks and american coffee now too! Spanish coffee is the best in the world!